Here are 4 wonderfully sweet wonton dessert recipes to prove that although most wonton recipes are savoury, they can be turned into sweet snacks to round off a good meal. To me, wontons have always been savoury but while I was looking for more information about wontons, I came across cooks with great imagination, creativity and culinary talent who use the wonton wrappers to make all sort of sweet and delightful desserts. I thought I had to share them here. They are a great way to use up leftover wonton wrappers too. For wontons that are going to be baked, I would recommend using an egg-less wonton wrappers. To all the sweet tooths out there ... with love. This is a Bob Blumer's recipe. 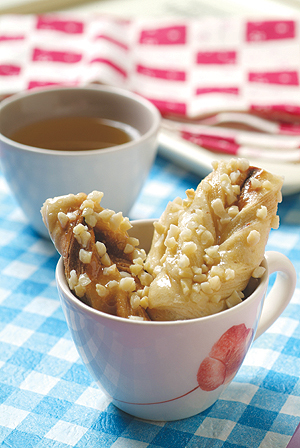 The ingredients include wonton skins, peanut butter, bananas and Hershey's Caramel kisses. Wet the 4 corners of the wonton wrapper and bring them together. Wet the sides and seal them to form a pointed parcel. Click to see a photo of the Chocolate kiss wonton. If you try out some of the recipes here, let me know how it goes. I have more ideas on using up leftover wonton wrappers.